"During the late 1980's, Alvaro Palacios travelled his native Spain selling French barriques to winemakers. But his journeys had a second purpose: to find the best place to achieve his goal of making Spain's greatest wine. He ultimately decided, in 1990, on Priorat, where he would achieve worldwide fame with "L'Ermita" and "Finca Dofi." But there had been a close contender: Bierzo. It had all the ingredients that Alvaro wanted-incredibly steep hillside vineyards, distinctive terroirs and, most importantly, ancient vineyards of Mencía-a unique red grape believed brought by French pilgrims during the Middle Ages. 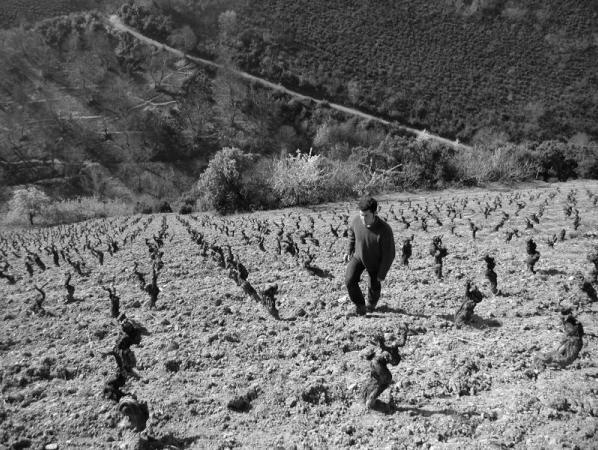 The idea of making great wine from old-vine Mencía never left Alvaro, and his experience in Priorat-particularly with L'Ermita-convinced him of Bierzo's enormous potential. Meanwhile, his nephew Ricardo Perez had finished enological studies in Bordeaux and was travelling across France-absorbing everything he could about great wines. He worked the harvest at Château Margaux, and did internships at other Bordelais firms like Moueix (Pétrus, Trotanoy, etc.). He also visited Alvaro frequently and came to share a belief in Bierzo's potential. In 1998, the two decided on a joint venture and set out in search of the region's finest old vineyards. Alvaro and Ricardo found promising sites in a number of villages but shortly came to believe that the greatest potential lay in a little town on Bierzo's western border named Corullón. Old vineyards lined the precipitous hillsides there, and the local soils were extremely poor-composed mostly of schist-but with incredible diversity. The minute variations in soils and exposures across this zone immediately reminded the two of Burgundy's Côte d'Or, or Piedmont's Langhe hills. In Corullón, Alvaro and Ricardo believe they have found a unique combination of soils, old vines, and a distinctive variety that will yield their own grands crus. Beginning with 2001, the estate began to make their case with individual vineyard bottlings. The winery is dedicated to Alvaro's father, and Ricardo's grandfather, who passed away in early 2000. The wines are a worthy tribute to the man who inspired them." Wine Spectator 92WS TOP 100 2018 Rank 35"This savory red offers notes of espresso, black olive and graphite framing a core of black cherry and licorice. Fine-grained tannins and fresh acidity keep this balanced. Harmonious and graceful." James Suckling 92 "Aromas of ripe berries such as blueberry and raspberry with slate and stone undertones. Full body plus silky and refined tannins that deliver a savory and delicious finish. Some pie crust and ripe fruit undertones too. Made from a selection of different vineyards of pure mencía. Wine Spectator 91 WS TOP 100 2012 Rank 57 "This plush red delivers black cherry, licorice, mineral and smoke flavors. Harmonious and focused, supported by well-integrated tannins and firm acidity. Not a showy wine, but has complexity and depth. Drink now through 2018. 50,000 cases made."